windycitysuperstore has no other items for sale. MODEL! HIGH OUTPUT PUMP! TWO 86" OARS! WARRANTY! If your address includes an apartment, unit or suite number, you must include it on your shipping address during checkout. Please make sure that the shipping address that you provide is valid. Incorrect and incomplete addresses or requests to change the address will require the order to be cancelled. We cannot ship items to a PO Box. If a PO Box is entered the order will have to be cancelled. Ebay does not allow addresses to be changed post order. Thank you! This is a great kayak. I bought two of them. Rarely can I get my 16 year old son to hang with us parents but when we got the kayaks he volunteered and we had a blast. We had them out of the bag and up easily. Realized we were taking on water when we didn't close the valve in the bottom of the kayak (HA!). Obviously didn't read the directions. We even grabbed them and carried them over a land bridge to another water area. Breakdown was easy (just bring a dry towel to wipe them down) and they fit in the bag easy. We plan on rigging them for fishing next. Great purchase from VM Innovations. Thanks! Great kayak for the price. I purchased this as my first kayak ever. I wanted an inflatable kayak because they're cheaper and easier to store. This one suits me just fine. The paddles and pump that are supplied are a bonus. The pump fills on the up and down stroke making inflation much faster. 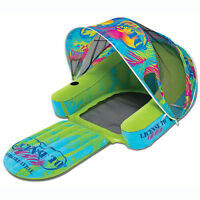 It inflates in less than 10 minutes for the kayak and seats. The only design flaw that I can see is that there is not a Boston valve for the bottom chamber. They have a flap valve instead so I over inflate so I can have enough in the bottom even with the air that is released as the valve is being capped. The Boston valves for the side chambers make inflation a breeze and it deflates in seconds. I was happily surprised when I could deflate, fold up and store the kayak, pump and paddles (when broken down) back into the storage/carry bag with room to spare. I've taken it out 3 times (once for each of my children) as of this review and it has handled very well. It handled some minor boat wake well too. The paddles are good enough for a starter. They are holding up well but they do make sturdier ones (if you're willing to spend more money). In my opinion I would recommend this for anyone. I purchased these kayak for our family vacation,and we wanted something that was quick to transport. First of all the sell was helpfull with the shipping right off the bat, and by combining both orders. Second the shipping was fast and arrive early then I expected. We opened up the package but didn't use them right away due to the weather. Once we were able to use the kayaks, the storage system was impressive. 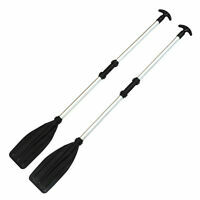 They were easy to inflate, easy to carry in and out of the water. I can honestly say I was impressed with my purchase!! So fun, super easy set up, back support only issue. Great value boat. So relaxing. Not frustrating.set up was easy, putting it away was easy. We rode down the river on it for two hour today. Not a lot of white water, so not any challenges but I think it would do ok. Paddles are fine. The straps to hook up the seat are centered low so it doesn't offer great back support, this might be problematic for someone with even minor back issues. I think I will find a new front seat for it. 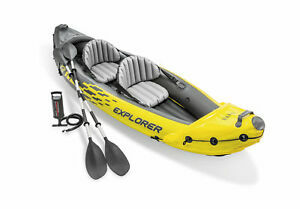 It is a bit more like a canoe than a kayak, but I think I like this better than a hard kayak for my purposes. I thought it was great. I am super happy I got it. Looking forward to more chill days on the river. Might even get another one for friends. So much more my style than tubing. Appears sturdy and with overall good design. Not too hard to maneuver either.